Dennis Grall | Daily Press Adam Bruce of Gladstone runs along a trail at the Gorzinski Family Farm property in Wilson Wednesday during the North Central Invitational cross country meet. Bruce finished in 16 minutes, 48 seconds to post the victory. 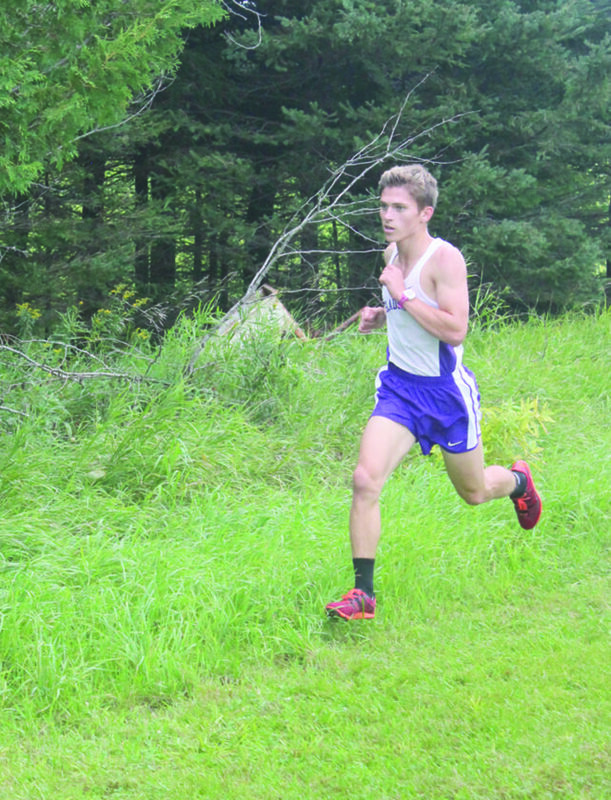 WILSON — Nobody could catch Adam Bruce in Wednesday’s North Central Invitational cross country meet as he cruised through the hilly 3.1-mile course on the Gorzinski farm property in 16 minutes, 48 seconds. The Gladstone senior was followed by freshman teammate Giovanni Mathews (18:30) and classmate Jake Strasler (18:59). “I’m happy with my time,” said Bruce, who won for the second time this season. “Our whole team ran well. This was a good warm-up for Saturday (Newberry Invitational). I like the course. Gladstone, which placed four among the top 10, won with 33 points. 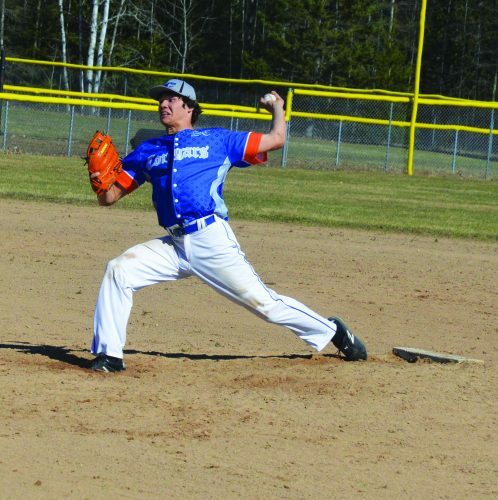 The Braves were followed by Rapid River 80 and Republic-Michigamme 92. The Gladstone girls edged defending champion West Iron County 69-77 for the title. Third-place Munising had 84 points. 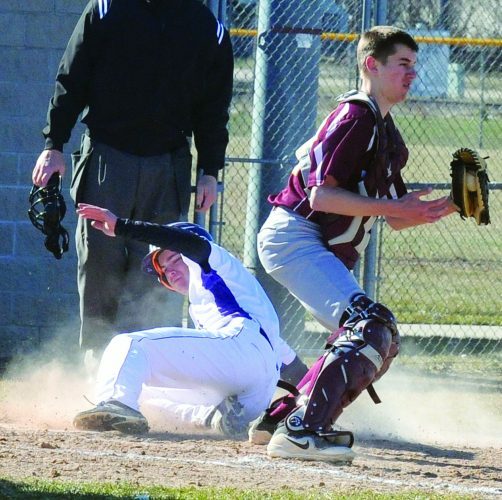 “I’m real pleased overall, especially with the boys going 1-2-3,” said Braves’ coach Gary Whitmer. “For Adam to run that fast on this course and Gio to take second as a freshman is impressive. “This also was nice for the girls. West Iron was ahead of us 44-46 through our fourth runner, then our fifth runner (Aleyna Wetthuhn) was 23rd and theirs was 33rd. North Central senior Griffin Johnson placed fourth (19:10), followed by Kingsford’s Brandon Malberg (19:21). Engadine’s leader was junior Hunter Sapp in 10th (20:05) on this cloudy and warm day. Munising senior Madeleine Peramaki won for the first time this season at 21:34, followed by Kingsford junior Lily Meneghini (22:34) and Superior Central junior Danika Walters (23:04). “I worked hard this summer on building up my distance because it felt like my body could handle it,” said Peramaki, who was runnner-up at Munising Aug. 21 and 10th at downstate Central Lake Aug. 18. “I’m still trying to get into racing shape. Meneghini was the first of three Kingsford harriers. Sarah Kulas placed fourth (23:33) and Sydney Scott was sixth (24:05). Gladstone’s leader was freshman Jamisyn Bergeron in fifth (23:45).